Located only 40 minutes northeast of Kamloops, Sun Peaks Resort is British Columbia’s second largest all-season mountain resort. 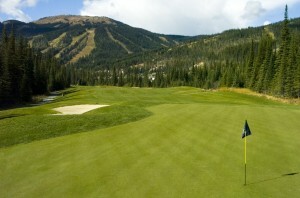 Known for skiing and snowboarding in the winter months, summer provides many adventures including a unique and challenging golf course. The 18-hole, par 72 Graham Cooke-designed course is centered along the valley floor amongst the three surrounding mountains, Tod, Sundance, and Morrisey. The course provides many risk/reward opportunities for all skill levels. At 1,200 metres, the 6,400 yard course is British Columbia’s highest. Bonuses of elevation are your ball flies longer, plus, the higher mountain air provides for cooler summer days; Sun Peaks is often 10 degrees cooler than Kamloops. The front nine was constructed back in 1996, and range from the short 122 yard par three hole 7 to the difficult, uphill 500 yard hole 6. 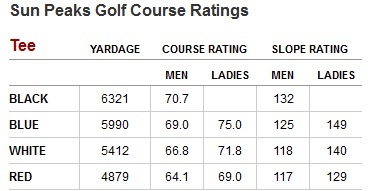 The front nine require delicate accuracy, due to the narrow fairways. Some even suggest keeping the driver in the bag and pulling out the irons. The signature hole honour goes to the short par four hole 16, with its terrific views of the homes and village below and Mt. Morrisey facing you. The 16th tee sits at 1,333 metres (4,353 feet) and commands a feeling of empowerment. For those seeking immediate reward, you can drive the green. 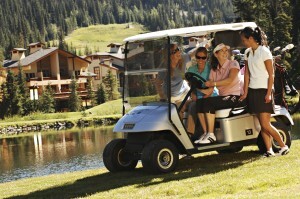 Sun Peaks Resort is ideal for golfers travelling with family or friends with varied interests. There are many activities to choose from: take a scenic chairlift ride to mid-mountain, spot the wildlife, mountain bike, hike, canoe, shop, dine, or take in the many festivals held throughout the summer. Be sure to check out the colourful alpine blossoms that present themselves in mid-July. Sun Peaks Resort offers a variety of lodging options to fit any budget, from village hotels, luxurious suites, and beautiful vacation homes. Sun Peaks Resort is a true mountain getaway.